I am exhibiting at this Saturday's Collaberama where Book of Lists will be making its exhibition premier. The event starts at 11 AM at The Millar pub close to London Bridge and is part of The Alternative Press festival currently taking place in the capital. As well as small pressers exhibiting their wears, Collaberama is a day of activities where visitors and exhibiters are encouraged to collaborate on creative activities together. Speaking for myself, the reason I write, draw and publish my own comics is that I am a control freak who doesn't like working with other people. So, if you're in the area, please pop by, even if it's only to see how long it is before I start shouting at very nice people because they've drawn something wrong. Book of Lists is go Go GO! Suicidal birds. Edible guitars. Licky dogs. Smelly saddles. Selective helloers. These are just some of the real events from my life which I have ordered into lists and then drawn up as comic strips. Now available to buy, Pbrainey's Book of Lists collects over fifty of the popular internet strips in actual reality book form. Copies can be ordered using Paypal from my website, or contact me here for alternative methods. 112 pages in full colour for £10.95. (Price includes post and packing to UK. International customers please visit The Shop for your button). Financial Assistance is acknowledged from Arts Gateway MK. Here's an ad I've put together promoting the actual reality Book of Lists book. Pretty good, isn't it? I imagine it'll appear in the next issue of There's No Time Like The Present or be printed up as a leaflet to annoy visitors with at events. Meanwhile, the book itself is scheduled to be dispatched from the printers on July 22nd and, barring some unforeseen catastrophe, will be available to buy a day or two after. Watch here for updates. I have just approved the cover to the actual reality Book of Lists book with the printers. This has got me so excited that I've decided to share the finished cover art with you today. I hope you like it. Here's an illustration called Dalek Invasion of Milton Keynes I did for Darryl Cunningham's new blog, Exdrawminate. On Exdrawminate, cartoonists and comic artists get to contribute their illustrations of daleks which are nearly always imaginative and witty. My drawing didn't turn out as well as I had hoped as I drew it on a really hot day earlier this week and the paper kept sticking to my arm. 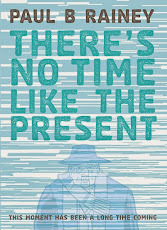 I recently did an interview with Alex Frith where I talked about my comics including There's No Time Like The Present. Alex is good, very good, but I think I was over excited because of the attention I was getting. You can listen to it on Resonance 104.4 FM in London or streamed here. Alex will also podcast it here.